The RMS Titanic was the world’s largest passenger ocean ship when it entered service. It measured 882 feet in length and that made it the largest man-made moving object on earth. It was perhaps the most famous ship that ever sailed. It was claimed that the Titanic would be unsinkable. This ship was built to a monumental scale. Approximately 600 tons of coal was used in the ships boiler room in a single day. The coal was hand-shoveled into its furnaces by a team of 176 men. Around 100 tons of ash got ejected into the sea every 24 hours. The Titanic main anchor was so large that 20 horses were required to move it. The ship was launched on May 31, 1911. Approximately 100,000 people turned up to see this. A first-class ticket on the ship cost $4,375 in 1912. It is equivalent to almost $100,000 today. This ship hit a 100 ft tall iceberg in the Atlantic Ocean on April 15, 1912, at 2:20 am and sank in less than three hours. 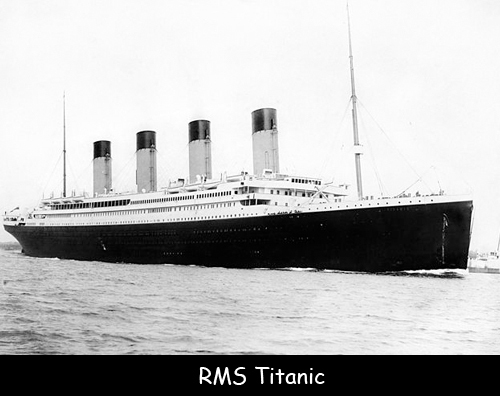 Titanic carried 2,224 passengers and only 710 of those actually survived. There were 12 dogs on board the Titanic and only 3 of them survived. The rescue ship Carpathia began taking on survivors at 4:10 am. Titanic received a total of six warnings about the iceberg during the voyage before the collision actually happened. The temperature of the sea water in the area where the Titanic sank was -2°C. In its final moments, the ship broke into two pieces. Later, a total of 328 bodies were found but 119 of them were so badly decomposed that they were buried at sea. Now, the wreck of the Titanic lies at a depth of 12,600 feet. So far approximately 6,000 artefacts have been recovered from the wreck site. Declan, Tobin. " Amazing Facts for Kids about Titanic ." Easy Science for Kids, Apr 2019. Web. 26 Apr 2019. < https://easyscienceforkids.com/titanic-facts/ >.